Spacious ground floor character house (145m2) with exposed beams, nicely decorated with antique and modern furniture. Private entrance via a large, south-facing terrace overlooking the garden and pool. Master bedroom with open fireplace, queen-size bed. Convertible sofa. The second bedroom has a queen-size bed (or twins, as requested) and we can add a single bed or crib. The independent kitchen is fully equipped with all you may need to make your stay comfortable. Additional outdoor seating on the covered courtyard terrace. The terrace has outdoor dining facilities, barbecue and lounge chairs. From the terrace, French doors connect to the spacious dining/sitting room. The dining table with its candle-light chandelier seats up to 8 people. A short drive from Carcassonne, Le Trabet, an 18th century former winery, was renovated to a high standard. Large pool, park, direct access to vineyards and woodland, ideal for cycling and walking. Free internet access. Surrounded by vineyards, woodland and sunflower fields. Large, secured pool and well-established gardens, woods and park. Le Trabet offers an ideal combination of a relaxed and active holiday. Glorious views to the Pyrenees and Montaignes Noires. Golf courses and lakes nearby. The Mediterranean beaches about one hour away. Only some minutes away from Carcassonne with its famous castle and close to the Canal du Midi where boats can be rented. Restaurants, village markets, Cathar castles, Mediterranean Sea and wineries all nearby. We had been looking for a place in the south of France for several years and fell in love the first time we saw Le Trabet with its stone facade and blue window shutters. As to ourselves, we have traveled far and wide. We were both born in Germany where we attended the university. We have lived in Wales and the US and are now happy to be at this beautiful property in the unspoiled countryside of the Aude province. Le Trabet used to be a winery, dating back to the 18th century. The Domaine has been painstakingly restored to accommodate three luxurious holiday homes. The estate is set in a small park with establishes trees, shrubs and hedges. The infinity swimming pool is fabulous. This is a superb property located right in the unspoiled countryside of the Aude province. As a photographer, I take advantage capturing the many beautiful details - or I just sit down and enjoy the view - Please see for yourself and take a look at some of the photos on our website Le Trabet. Free computer broadband available (Wifi). Cots, high chairs and baby pens available at no charge. Bicycles and helmets provided at no charge. Jeu de boule equipment. Playroom with table tennis. Free access to tennis courts in nearby villages (tennis rackets available). Catering service and baby sitting available on request. Central heating for the winter months (we charge for electricity from October to April). Please check our website www.letrabet.com for more information. All linen and towels for inside use are provided and are renewed every week. Please bring your own pool towel. Each gite is equipped with a large outside table, chairs and lounge chairs and has its own WEBER barbecue. The pool's spacious terraces have sun loungers and umbrellas. The infinity swimming pool is quite large (7x14m) and is well secured by a fence. Next to the pool there is a playground with swing set, suitable for young children. 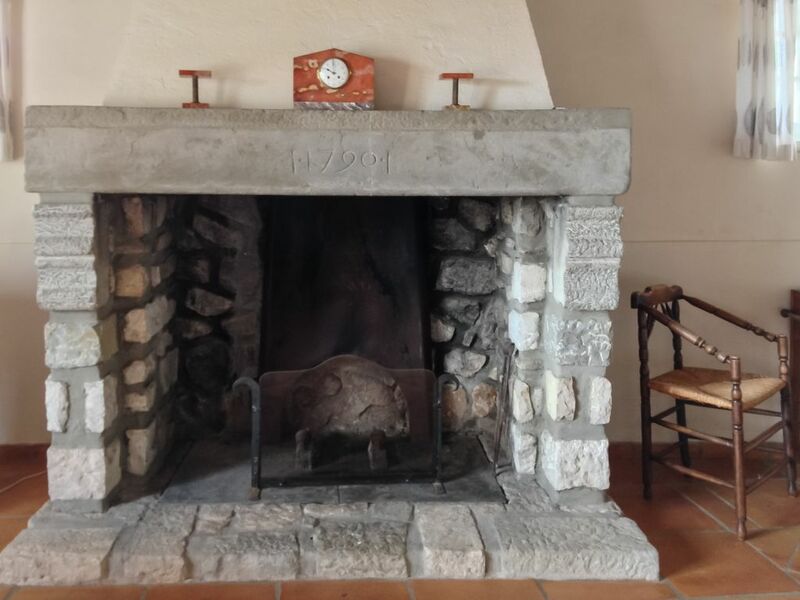 Charming and well equipped property ideally situated close to Carcassonne and the Languedoc area.. The gîte was ideally situated for touring the local area and there was plenty of information and brochures for activities and visits in the area available to read and help plan our days out. Blessed by good weather, even in October, we thoroughly enjoyed our visit to the area. Thank you for a lovely review and most of all, thank you for spending your holidays at Le Trabet, we thoroughly enjoyed your presence! We stayed in La Palmier which was located at one end of the property which made it feel very private whilst still enjoying the enourmous garden and surrounding grounds. Fabulous accommodation, fully equipped for self catering with lots of 'extras' e.g., bikes, drinks in a fridge by the pool, table tennis table & boules games. There were sun loungers & a table and chairs on our terrace and lots of other seating areas around the grounds. The pool was lovely - large and very well maintained with a child proof gate for safety. The nearest supermarket, patisserie and butchers was a short 5 min drive or 15 min bike ride away. Carcassonne and Lac de la Cavayere both worth a visit within a 30 mins drive. We would definitely reccommend. Beautiful property surrounded by sunflowers, a very relaxing place to stay. We stayed in La Palmier - full of character and charm and well equipped - a truly stunning gite. The grounds are gorgeous and immaculate with an excellent swimming pool to relax in. Owners and guardians charming, helpful and informative. Lots of beautiful towns to visit including Carcasonne and a boat trip along the Canal du Midi is fascinating and relaxing. An excellent place to go on holiday we would love to return to Le Trabet. Le Palmier is a majestic property with a truly magnificent private large patio, stunning living room and master bedroom. Claudia provided BBQ fuel and a delightful welcome pack including patisseries and homemade jam. The second bedroom, was smaller but comfortably homed three girls in separate beds aged 13, 11 and 9. The grounds are extensive and beautiful; I celebrated my fiftieth birthday enjoying a candle lit BBQ around the Dovecot. The facilities were fantastic; amazing pool, great bikes, table tennis and romantic seating scattered throughout the grounds. Claudia is an amazingly hospitable hostess and very proud of her home and properties. My husband's baggage didn't arrive in Toulouse but Claudia supplied him with a pair of swimming trunks so our holiday could begin immediately! I would highly recommend this holiday destination. Thank you so much for choosing to stay with us this summer, we enjoyed your being here and thank you for your kind words. Carcassonne airport is 15 minutes away. Direct flights from many destinations in England, Ireland, Belgium and Germany. Toulouse's international airport, Blagnac, is one hour's drive by motorway. Some of our guests fly to Montpellier, Beziers, Perpignan or even Girona (just across from the Spanish border). Car hire available at all airports. Domaine Le Trabet is best reached by car (about 20 minutes from the motorway exit). The nearest village is some minutes away with all amenities like bakery, butcher, small grocery shop, restaurant, bar, doctor, pharmacy. Carcassonne is 10 minutes away. Most Cathar castles are within one hour. Many village markets close by; the nicest ones in Carcassonne, Mirepoix and Revel. The Mediterranean coast is about one hour by car; large choice of beaches like Narbonne Plage, Gruissan, Porte La Nouvelle and Leucate. Fresh fish at the harbours of Gruissan (mussels and oysters at its pier) and Porte La Nouvelle. Good fresh seafood restaurants.